Rarely for me in this life are the elements of a particular day so joyfully copacetic and grounding, that I lay down at the end, exhausted, with renewed hope for our species. I do recognize that this simply might mean I need to work on my perspective a little, which is undoubtedly true, however this day was definitely one of those days. Early this year, Rick Thomas from Sterling College reached out to explore having me visit as a guest instructor and share spoonmaking skills with the students in his Working Horses, Working Landscapes course. 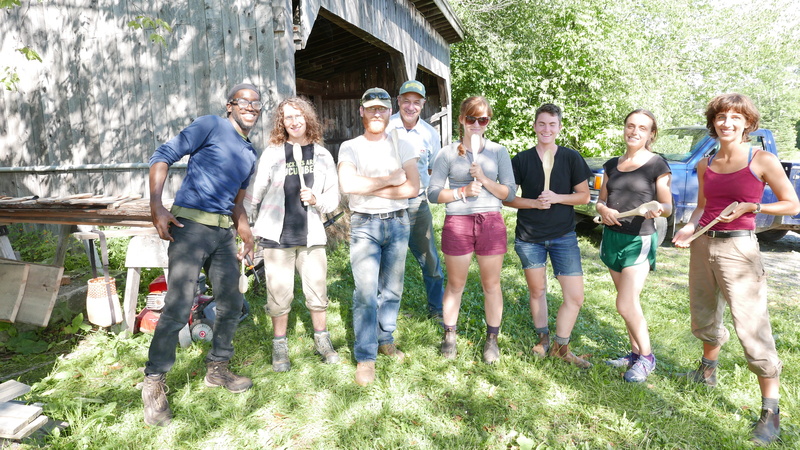 This course, focused primarily on draft animals as valued, respected, and revered participants in today’s agriculture, is one part of Sterling’s School of the New American Farmstead program. 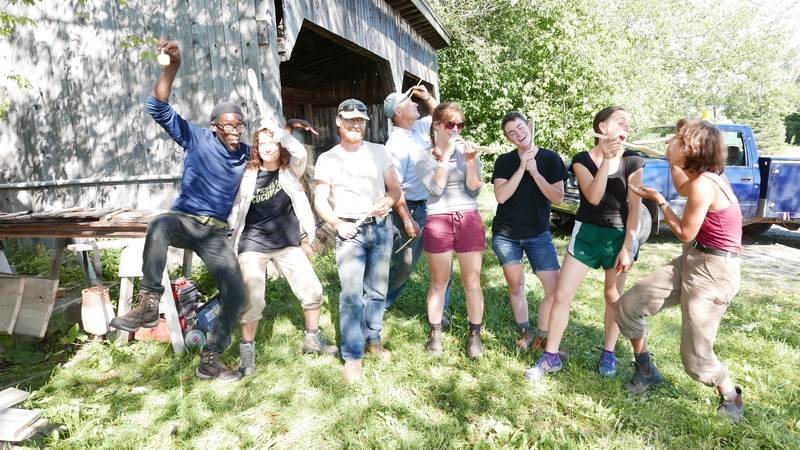 Well if you know me, you wouldn’t have to twist my arm to get me to drive out to Craftsbury, VT, blasting The Duhks along the way through a sparkling August day to carve spoons together with a group of spry young people who signed up for such a program. Not to mention the delicious lunch, much of which came right from the Sterling farm. Oh, and there was the modest timber-framed green-woodworking building perched atop a hill amongst a few outbuildings, the lower half of which infilled with cordwood masonry, sporting wide views of the working farm, barns, and hills beyond seemingly intentionally spread out before it. Oh, also, there was the great and cheerful company of Rick Thomas, who in the span of the afternoon espoused so much knowledge to me as we walked the land that I had to pull over on the way home to take notes from my overflowing brain before the important stuff, like preparing the land for fruit trees, or clearing the ground beneath a favored variety of tree particularly loaded with seed to receive and start new trees, was lost to me on my drive home. It was outside of the green woodworking building, in the shade of a Cherry tree, that we spend the warm afternoon learning to handle the bent knife and transform green wood into kitchen spoons. I have observed that learning spoon carving, no matter if or how you receive instruction, begins awkwardly as you learn to hold the carving knife. Some learn well by reading a technical description of how to carve, others learn by looking at pictures or observing a demonstration, and some by doing. I do my best to instill a respect for the very sharp blade, and spend some of the first hour trying to reel in some wild whittling and dangerous knife wielding. But most of what happens is discovery through trial and error, a little frustration, with a little guidance. I’ll deliver small presentations of some other ideas about what is going on throughout the process. For the beginner, starting to carve out the bowl of the spoon is slow going. The tendency is to use a lot of force and a severe angle, trying to take out a lot of material at once. But eventually you create enough of an even, shallow concave across the whole bowl that the curved blade begins to more agreeably slice the curved surface. And there is the sound of a group of people carving. If I stand among the students in a workshop like this and quietly listen, the sounds reveal where they are in the process. After about the first hour of carving, many in this class found what I kind of consider a magical place where the spoon and knife and hands are coming into a harmony of motions. What is interesting to me is that along the way you might come up to any student as they carve, and each of them will be at a really different place with carving out the bowl, but, by the end of the class, as they worked out ways to hold the tool and spoon, and to carve, they are all yielding similar results. This craft does lend itself, as Rick Thomas said, to quiet contemplation, and is a physical manifestation on a hand-held scale of technical problem solving. The concept of design in working with fresh green wood forces you to consider what is already there that you can see, as well as what is hidden inside; the potential. You can impose your creativity on the wood only to the extent that the grain will yield to the blade and the coordination of your hands, much like all of the living systems in which we interact. But by taking small, thoughtful cuts, be they with a carving knife or a furrow, and developing a keen awareness of what is beyond what you can see, you can be a part of revealing what is already there. Thank you to all of the students pictured here, and to Rick Thomas, for inviting me to share this day! It was all I imagined, and even more was revealed as we worked with our hands together under the Cherry tree. The Spoontastic Side of the class.